Determined pioneers organized the County’s first high school in the San Ramon Valley in 1859. Named the Union Academy, it was a private high school located midway between Alamo and Danville and served both day and boarding students. A Historical Society sign on Danville Blvd. across from El Portal recalls the school’s location. This school was initiated by the Cumberland Presbyterian Church Synod in 1857 when it appointed three county residents to select a County high school location. Protestant churches were in the forefront of school-founding movements in the West. Ministers often were commissioned by East Coast missionary societies to establish new high schools. In Contra Costa, the school search committee members were from Martinez, Lafayette and the San Ramon Valley. They looked for a site, but in the end, each wanted the high school in his own community. Responding to this impasse, the Synod appointed a committee of five non-residents to select the location which chose the centrally located community of Pacheco. 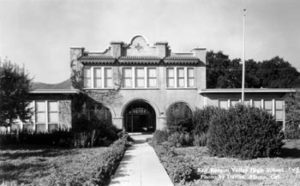 Alamo’s Mary Jones recalled that “leading residents organized the Contra Costa Educational Association,” with Silas Stone, John M. Jones and Robert Love on the first Board of Trustees. Stock was sold by the Association to support the new school, and August Hemme sold 2 ½ acres of his large ranch to the Trustees. The land was listed as worth $200 in the 1860 Deed Book, but the philanthropic Hemme may have sold it for less. The cornerstone was laid on Oct. 19, 1859. It was a two-story building with windows and a basement. The largest building in the San Ramon Valley, it also hosted meetings, graduations and church services. It cost $32 a month for a high school student to board. The school opened in the spring of 1860 and its courses, trustees, purposes and fees were featured prominently on the front page of the Contra Costa Gazette. Primary and intermediate departments were also available. The academic curriculum was based on that of the San Francisco School Department and included Greek and Latin. For an extra charge, there was instruction in music (with use of instrument), drawing and painting. Vocal music and calisthenics formed a part of the daily exercises for which there was no extra fee. Each June, the school had graduation exercises which included examinations of the scholars. The Gazette on June 23, 1860, said the “young masters acquitted themselves in a highly creditable and satisfactory manner” before an audience of 400 people. The program included: “Music and Declamation, Delivery of Pieces, Tableaux, Calisthenics and a Party Song.” Later a monthly newspaper called “The Waifs” was published. The academy was a prime example of the importance of education to families in rural California and in the San Ramon Valley. Most in the community supported it through thick and thin, although some local farmers ranchers objected to music as part of the instruction. On July 6, 1868, after the school had closed for the summer, the Academy burned to the ground. No one was hurt, but the satisfaction and convenience of having their own high school came to an end for Valley settlers. It took 42 years before the next high school was founded, the San Ramon Valley Union High School.